Bharat Sanchar Nigam Limited (BSNL) has today announced a revision of tariff of its Prepaid CDMA service. BSNL has with this revision reduced the call rates for all its CDMA Prepaid users all over India. Now BSNL CDMA users can make all Local and STD on-net calls at just 45 paise/ minute instead of the previous price of 60 paise/minute for Local calls and Rs. 1.20 for STD On-net calls. Also now Local and STD off-net calls will be chargeable at just 60 paise/minute instead of the previous 90 paise for Local and Rs. 1.20/minute for STD off-net calls. 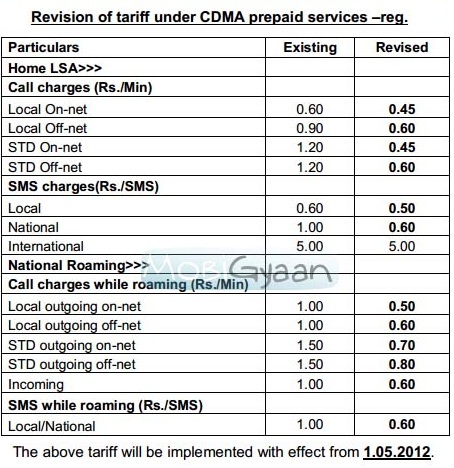 The above tariff will be implemented from 01-05-2012.